The fact that the shale revolution has saved Americans $74 billion per year and has made the U.S. the top oil producer in the world is, to put it mildly, a big deal. Even more important, however, is the fact that hydraulic fracturing has transformed and continues to transformed the lives of millions of underserved Americans. While people and opportunities are moving from rural America and towards the largest cities, it is primarily in the places left behind that the oil and gas industry will be creating 3.5 million jobs and contributing more than a trillion dollars in state and local taxes over the next twenty years. We have already seen miraculous revitalizations of towns in the Permian Basin of West Texas and eastern New Mexico as well as the Marcellus Formation in northern Appalachia—sparking further benefits, such as China’s $84 billion investment in West Virginia. For these areas, increased oil and gas development is a godsend. Yet, distant from the outsize benefits that fracking has brought to Americans in the nation’s heartland, Californians are more likely to know only the alarmist claims about fracking featured in the debunked Oscar-nominated documentary Gasland. While New York City is geographically close to New York’s shale-rich Southern Tier, the cultural distance makes for a wide expanse: whereas crowds were split for 2011 public hearings on fracking held in upstate New York, they were roughly 99% in opposition to fracking in hearings held in Manhattan. 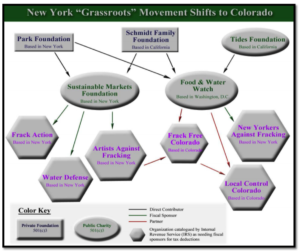 The Manhattan crowd, which included actor Mark Ruffalo and frequently erupted into shouts, finally claimed success in 2014 when the state of New York superseded local decisions and banned fracking statewide. Not content with dictating the policies in their cities and states, coastal elites are deeply interested in influencing the policies of other areas of the country (and world). Billionaires such as William Hewlett, Eric Schmidt, and Tom Steyer have created foundations in their home cities, but the money does not stay there. With the exception of the William Penn Foundation, which is located in Philadelphia, the ten foundations covered by Big Green, Inc. are located in California, New York, and D.C., yet these foundations have granted over $600 Million to organizations in other states. [*] This number does not include the countless millions of dollars given to local organizations that then fund operations in other states, such the San Francisco-based Earthjustice which has brought lawsuits in Utah, Arkansas, North Dakota, Louisiana, and more. Nor does it include the money that environmental activist donors have paid to place prosecutors in state attorney general offices. It is doubtful that the foundations’ targeting of Colorado was arbitrary. As a swing state, Colorado is among the first on environmental groups’ list of states to capture. Over half of the out-of-state grants made by foundations tracked in Big Green, Inc. were given to organizations in swing states; from 2008 to 2016, the foundations granted $359 Million to groups in Colorado, Florida, Iowa, Michigan, Minnesota, Nevada, New Hampshire, North Carolina, Ohio, Pennsylvania, Virginia, and Wisconsin. These grants fit with environmental groups’ larger strategy of weakening support for Trump and Republicans in swing states. Environmental groups are more likely to find receptive audiences with Democrats in state and federal offices, but environmental issues may not be the sole motivation. Though most environmental groups are nominally nonpartisan and single-issue, the foundations and billionaires that bankroll them have other interests as well. For instance, the Hewlett Foundation is a major financial supporter of Planned Parenthood, and Tom Steyer, the founder of the TomKat Charitable Trust, is the largest individual donor in Democratic politics. Steyer’s partisan convictions may have factored into the decision by his environmental advocacy group, NextGen Climate, to spend $25 million in 2016 for get-out-the-vote efforts targeted at young people in swing states. Environmental groups’ larger political ambitions are neither unique nor surprising. But as we hear reports in the media about anti-fracking initiatives spurred by Local Control Colorado or mass demonstrations against pipelines in North Dakota, it is worth reflecting on the foundations and Billionaire’s Club that finance them. For those whose only experience with the oil and gas industry is from watching villainous executives in movies, “energy development” is a dirty word. When their out-of-state activism receives local pushback, they dismiss it as the workings of proudly ignorant racists. These people should not be dictating policy for the millions of Americans for whom energy production is part of their world and whose livelihoods, purchasing power, and communities (such as Craig, Colorado) are on the line. To follow the money behind the environmental left for yourself, visit the Institute for Energy Research’s latest project, Big Green, Inc. I. [*] Found using data available at Big Green, Inc.– total amount in grants excluding organizations in CA, NY, and DC, and excluding William Penn Foundations’ grants to PA organizations.